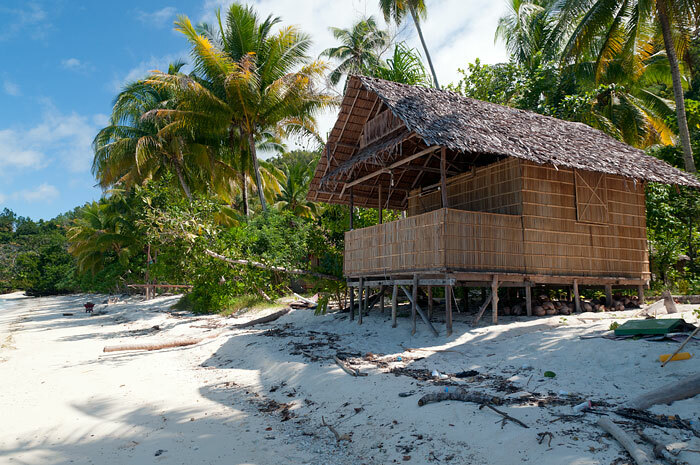 Yenanas Paradise Homestay sits in the shade of coconut palms on the beach to the east of Yenbeser village. Five single room, private bungalows and a two room bungalow are available. 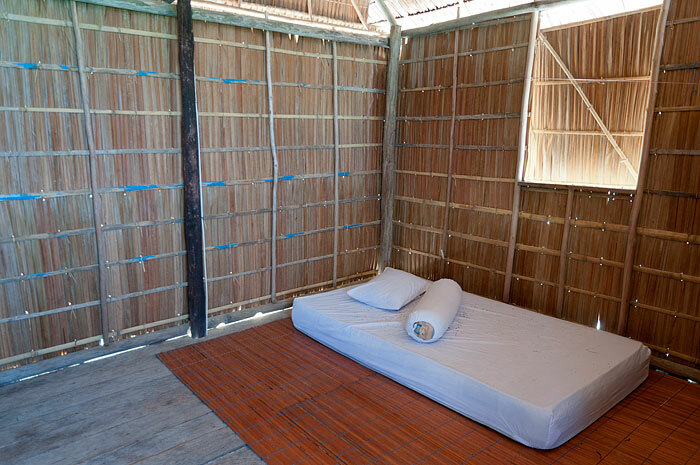 Each room has a double mattress on the floor with sheets, pillows, bolsters and mosquito nets and power outlets and room light switches are provided. 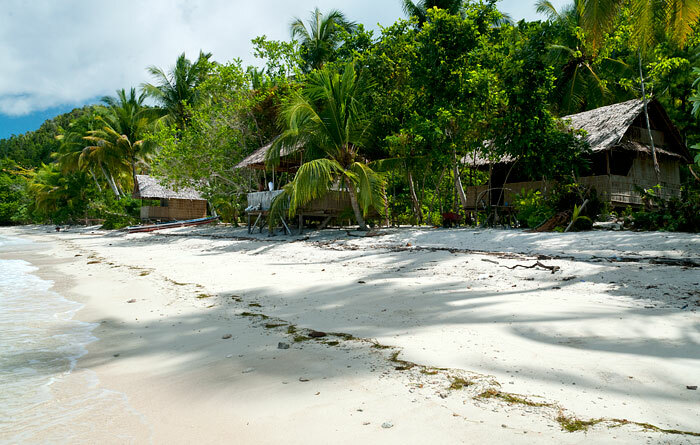 Two private bungalow are on the beach, while the others are set back among the trees just behind the beach. but still have ocean views. All have a small verandah at front that provide ocean views and are equipped with small tables and chairs. The two room bungalow verandah also has views to the beach and has table and bench seating provided. 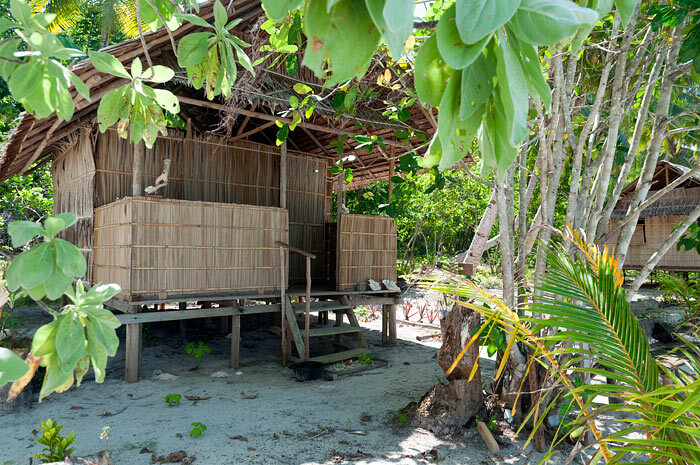 Meals are served in Yenanas’ large beachside dining shelter where drinking water, tea and coffee are always freely available to guests. A refrigerator is also provided. Several tables and bench settings are also available in the shade of the beachfront trees for relaxation outdoors. A western style pedestal toilet and dip mandi bathroom are provided in a separate rooms in a bathroom building that is shared by all guests. Yenanas Paradise Homestay has good cell phone reception and electricity is provided by a combination of solar and generator. 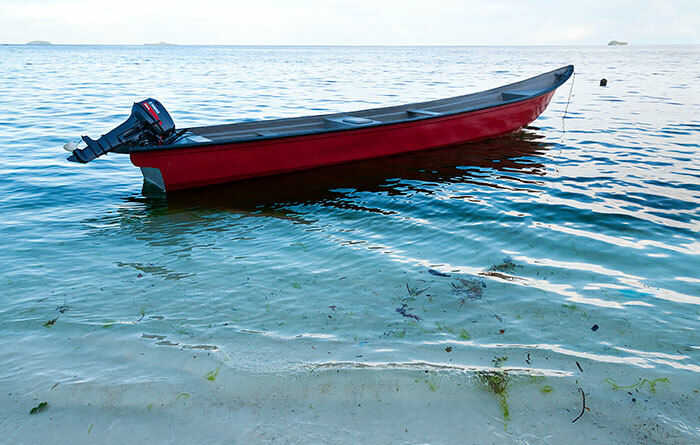 If you need supplies, the village of Yenbeser on Gam’s south coast is a five minute speedboat ride away. At low tide it’s possible to walk there along the beach. 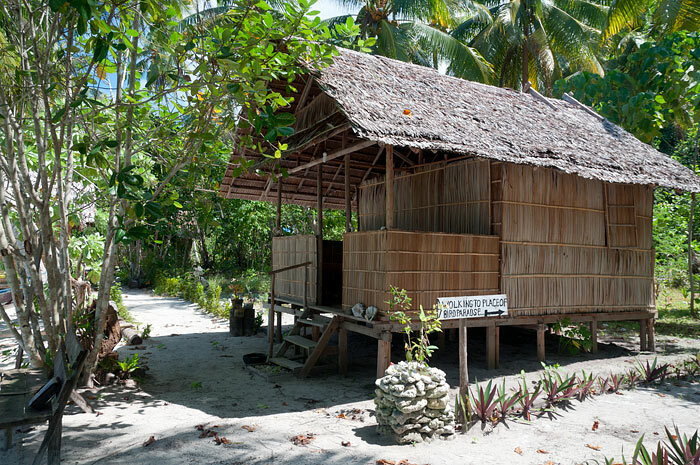 Be sure to take all your inorganic rubbish away with you when leaving Yenanas Paradise Homestay. There’s no non-polluting means of disposal of such trash in Raja Ampat. English is spoken at Yenanas Paradise Homestay. Waisai transfers cost IDR 500,000 each way and are by longboat which can carry a maximum of five passengers. Total trip cost is shared by passengers. Diving is available at Yenanas by arrangement with neighbouring operators. Providing sunrise ocean views, the Yenanas Paradise beach also has a strong freshwater spring which bubbles up on the seabed and is accessible at low tide. Turtles and small sharks are often seen in the shallows by day and walking sharks can be seen at night. Apart from birds of paradise, cuscus, tikus besar and a host of other birds and smaller animals, the nearby jungle also conceals a grove of bamboo containers used long ago in magic rituals conducted for individuals by Yenbeser’s village doctor. Jungle trails lead from Yenanas Paradise to a tree where Red Birds of Paradise come to display. The display tree is about an hour’s walk from Yenanas and a deviation to take in a panoramic viewpoint can be made. Other interesting places to visit nearby include the Kanji-inscribed Japanese naval survey marker on Monkairi (Batu Lima) and other war relics in the jungle near the village of Yenbeser. Prices are quoted in Indonesian Rupiah and with the exception of the Bird of Paradise tour, are per boat, shared among passengers. In addition to the tours below, Yenanas can organise trips to any other location you want to visit. Karel & his family made our staying comfortable – one of the beautiful things about Yenanas is the long beach where you can move a little away either direction and there is a small path behind the homestay where you can walk through the jungle up the hill, thank you Karel & Family – we had a wonderful time at your place!!! I liked Yenanas so much I stayed for 9 days. Karel and Teresia and there children did everything to make me feel at home. Karel arrived in time to pick me up at Waisai with his son and Teresias cooking was always tasty, lots of grilled fish, some chicken and an egg with rice or noodles for breakfast. 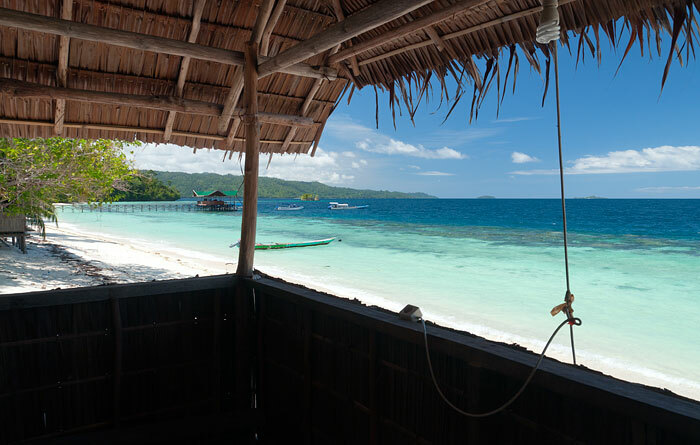 My bamboo hut was spacious with a queen size bed and mosquito net, mind you there were next to no mosquito s. The snorkeling is very good from the far left to two hidden beaches on the right, I even saw pink Coral. We stayed at Yenanas Paradise from the 14th of November until the 19th of November. Yenanas Paradise is really a TRUE Paradise! 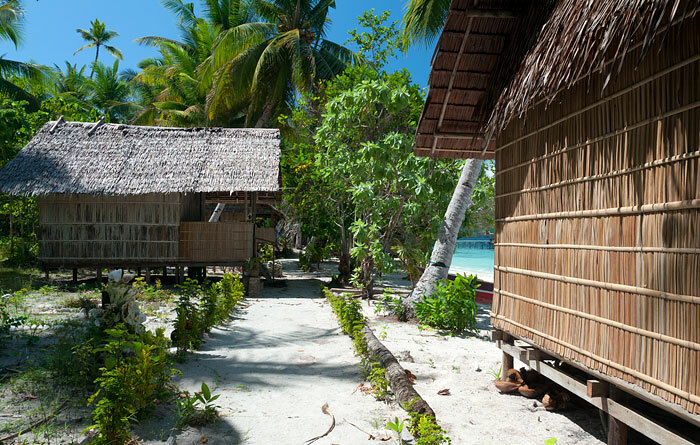 The lovely cottages covered with large green trees and situated at the most beautiful white beach I could imagine. We had a memorable stay and would definitely go back in the future if we can. The owner, om Karel, as well as his wife and kids are very warm and welcoming and really made our stay to be fantastic! His wife has amazing cooking skills! Everyday we had fish straight out of the ocean! She has even made a special dish, papeda sagu, for me. The beach is amazing and really quiet. The sea is just perfect. Just in front of the beach there is an amazing house reef. We had seen plenty of fish, fish like squids, clowfish, walking shark and even a blacktip reef shark. There is also a neigbouring Diving Resort if you’d like to dive. I have done a couple of dives, which were amazing as well. Saw too many fish to describe. The best diving location I’ve ever been to. In the morning when we were having breakfast we even saw a group of dolphins passing by. Just perfect! At Yenanas Paradise we also saw a spotted cuscus and went for a walk up hill to see the Birds of Paradise. We saw a couple of them. Karel and the family are loving people and his kids were companying us and helped with whatever we needed. Thank you once again for having us at Yenanas Paradise. i stayed in yenanas paradise h.stay 13 days in november and 8 days last gennuary. the place is very beautifull, with a long and white sandy beach. coral reef is preatty good expecialy the left part untill the end of the beach , but better you expore on your own.opposite the and of the beach if you go left over and after the corner , the reef is nice , but probably the best place is five rocks(batu lima). karel family is very friendy and his wife cooks very good food. the bungalows are very clean ,big, and comfortable. i miss the family very much expecialy the kids mojo, and wendy. hello to the family and to arif too. A medium-sized Homestay with 5 or 6 bungalows and a couple more under development. There is good snorkelling in front of the homestay. Karel and his family are very pleasant and do their best to make you comfortable. The food is fine, and there are cakes at tea-time. There was some initial confusion over my booking (and that of another tourist) for private bungalows, but this was resolved within a couple of hours. There is a dive resort close by so you can purchase alcoholic drinks and there is good internet reception. Managed to catch a glimpse (they are a long way up in the canopy of the jungle) of a Bird of Paradise, but only because one of Karel’s children was there to point it out. I stayed two nights at Yenana’s and really enjoyed it. Stunning location with coral reef right in front and jungle behind. Food was delicious, different fish dishes each day, with extra snacks between! Cabin simple but comfortable. Also very convenient for affordable accommodation if diving with Biodiversity, which was my primary motivation for originally choosing Yenana’s. Thanks Karel and family!! We spend 4 amazing days with Karel and his nice family. The homestay is very clean and comfortable, very well looked after and the food was divine. The family is very hospitable and did everything they can to make our stay as comfortable as possible. 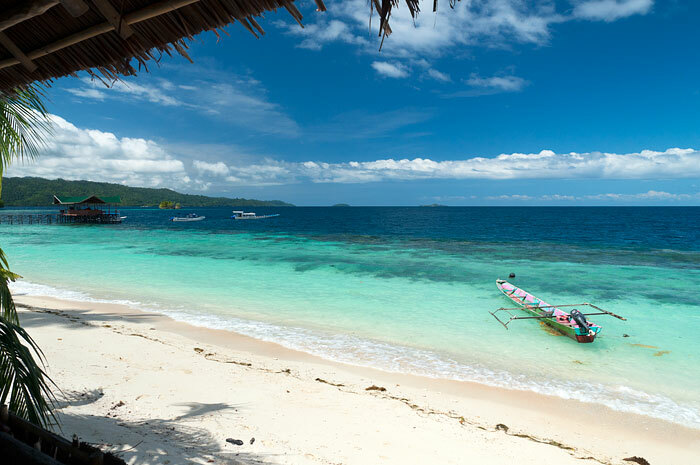 There is a beautiful coral reef just in front of the homestay which you can snorkel to, and Karel is offering bird watching trips or boat tours to other islands. You can dive with Biodiversity Resort which is just 200 meters away, so you can enjoy a combination of affordable accommodation, great food and professional diving. Thanks to Karel and family for a very enjoyable holiday! Hi i am planning to stay at Yenanas but wondering if i can arrange for Wayag tour with neighbouring homestay that provides such tour. Is that something that can be done? If Yenanas can’t arrange one for you then yes – you should be able to organise one with a homestay that can. Applying the “Wayag trips” activity filter on the accommodation page will quickly return all the homestays that advertise them. You can narrow the search by applying location filters at the same time. We spend 8 days in Yenanas Paradise. The bungalow was direkt at the beach. Everything is basic but clean. The food was great. The family is really friendly, and speaks just a little bit English. The beach is beautiful, good swimming and snorkling. 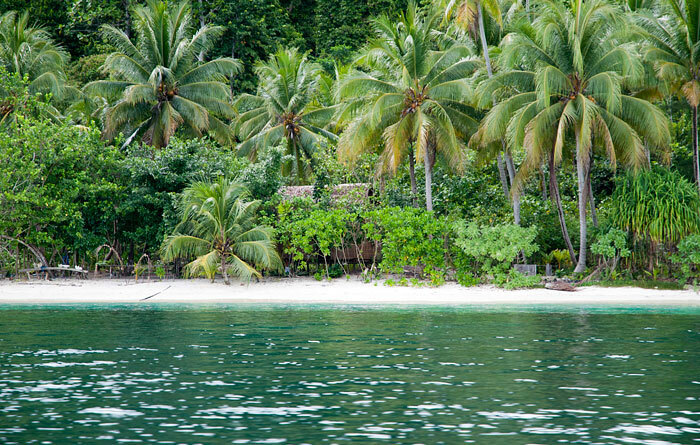 You can dive with Biodiversity Resort, if they‘re not booked out. We did some dive. Great diving! Hi thank you very much for your best comment for us. All the best for you. We spent 8 amazing and peaceful days in Yenanas Paradise in mid-January. We thank you for unforgettable holiday. Cottages as well as toilet are simple and clean. 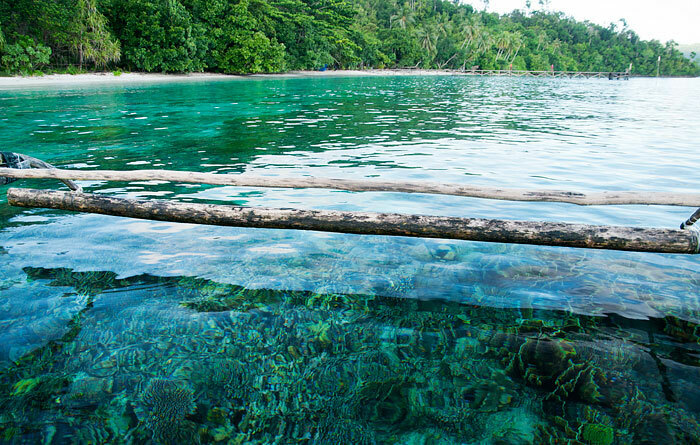 Coral reef in front of the homestay is very well accessible at the high tide as well as at the low tide. And the most important is that the sea was mostly calm, without strong current, so it was safe for snorkelling. Beside many other coral fishes we saw turtles, little sharks and also dolphins. Or you can just relax on the beach in the hammock, listen to the voices from the jungle and watch big parrots around. Sometimes cuscus is coming late afternoon looking for the best leaves on the trees behind the homestay. Only we did not have luck to see bird of paradise, despite our host tried to call them. They showed us that they are wild birds and a human can not command them. But even climbing up the hill in the dark morning jungle was an adventure experience for me. The food was excellent! Usually was served various fishes, always with a lot of vegetable as a side dish and fresh fruits as a desert. We recommend learning a little Bahasa as it helps in communication with the host and his lovely family. If we have another opportunity to visit Raja Ampat, for sure Yenanas Paradise is the place where we would love to come back again. We spent 3 days in Yenanas. We liked the bungalow, with a good mosquito net. The food is really good, especially the breakfast, and you have also something to eat in the afternoon, perfect after a snorkelling session! 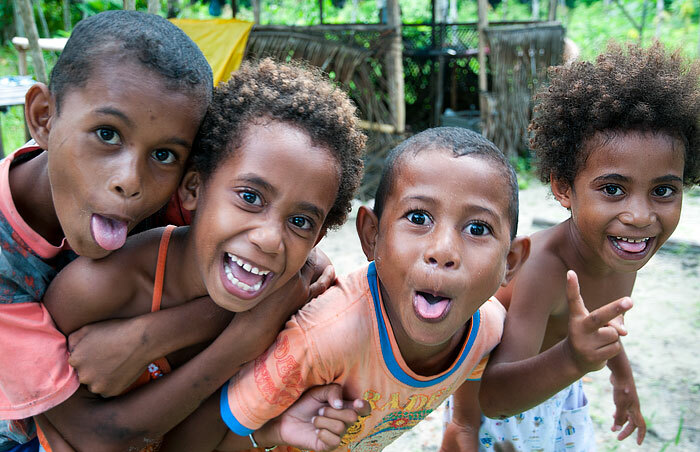 We went to 2 homestays in Raja Ampat and it was the better food by far. The snorkelling is really beautiful, awesome corals! It’s better to go at high tide though, otherwise it’s difficult to enter the water at low tide. Family is nice, they don’t really speak English, one man does however. You have electricity in general from 6 to 10 pm. They don’t answer their Facebook messages, only text messages by phone. Spent 4 days in Yenanas. Bungalows are basic but pleasant. Really appreciated the food (1st class, a special feeling for the wild pig stew). The reef in front of the beach is beautiful, excellent for snorkelling with easy access from the beach (less than 25 meters) even at low tide. Saw a few sharks and all the usual tropical fish. Good and pleasant interaction with the family, although without bahasa basics, I guess it might be a bit limited. One question : I wonder if the extra cost 400/day instead of the usual 350 is justified. Maybe the excellent food ? A very good homestay to relax, great food and a really fantastic home reef with a lot of different corals. Thanks to Yenanans! Great food (breakfast was one of the best we had in the homestays of Raja Ampat), nice bungalows, fantastic beach with great snorkeling. The toilet and bathroom perhaps needs a little love. Simple bungalow at the beach, a calm long beach. Okey food three times a day. The owner speaks little english, and he had Red bird watching-trips (you walk around 40minutes in the djungel) two times per day. You get what you need and nothing more. We had a wonderfull stay at yenanas. It is really simpel but the place is pure paradise. 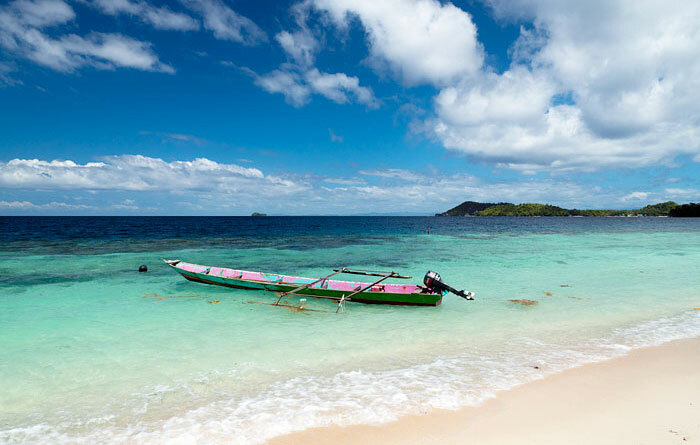 There is not much action tho, so if you are looking for jet ski it’s the wronb place but if you are looking for a beautifull island with good snorkeling infront of the beach and a wonderfull hostfamily it’s where you have to go! Very friendly and helpful. Lots of activities or idyllic beach of you just want to chill. Lots of good food. Lovely families. Rooms are simple and clean and cute. Pros: Great food, friendly hosts, individual bungalows(2) so private if you want it, Wonderful views, Awesome reef, snorkeling gear, hammocks, western toilet,birds of paradise that show up every day! Cons: One bathroom for both bungalows and the 2 joined rooms – and it is about 50 meters walk from furthest bungalow. No light switches in rooms or bungalows – all controlled by one main switch at the host’s kitchen – so he decides to turn off everyone’s power at the same time, while leaving it on for himself. You can work around this by unscrewing the light bulb if you want to go to bed earlier than your neighbours, and going and telling him to put it back on if you want more light, when he shuts it down. Not really satisfactory and could be easily fixed by buying 4 switches. 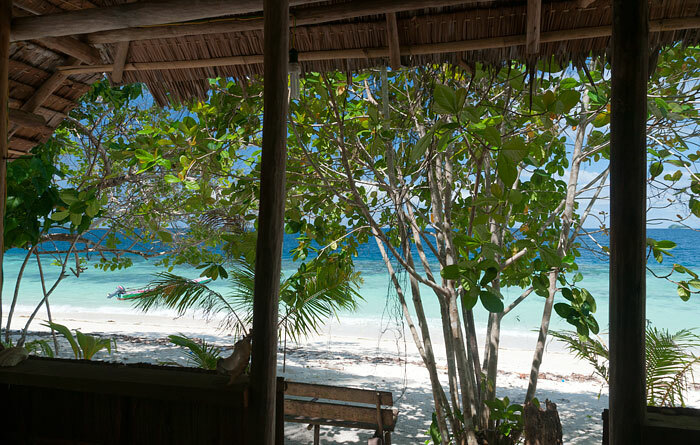 Bungalows on beach can be very noisy because the sea is crashing on the beach right under you all night, though you might find this soporific – we did! This place is great. Beautiful beach and reef with turtles, sharks and lots of fish. Great snorkelling in particular around Batu Lima. Cus cus and parrots are also in the trees along the beach. Best food we had at any homestay and afternoon tea every day. Feels very peaceful and remote. Biodiversity next door does diving and cheap snorkelling trips. Highly recommended. Stayed here for four nights in May and thoroughly enjoyed it. The snorkelling is fantastic: there is a reef literally a few metres off the beach which you can discover at your leisure (when the tide is in; when it’s out, it gets too shallow), and we had the beach entirely to ourselves. We’re not divers, but Biodiversity next door has diving facilities if you are. We took an early morning hike up to the bird watching hut and were rewarded with a red bird of paradise and a hornbill. At night there are crabs on the beach and there is the Southern Cross in the sky. The food is delicious and copious (two cooked meals a day and pancakes or pastries for breakfast and for tea/coffee around 5 pm). The owner and the family that live on the beach are very friendly and welcoming, though contrary to what it says on the website they have almost no English, and there were a few confusing miscommunications. They also seemed unaware of the dates we had booked (and confirmed), but this didn’t make the welcome any less warm. 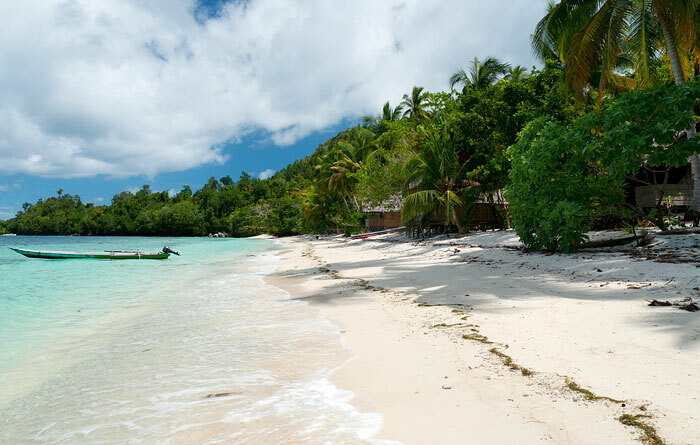 This is not a resort that offers lots of activities or entertainment, but if you’re looking for turquoise sea, a quiet white beach, green coconut trees and a spectacular coral reef then this is the place to come. We stayed one week at Yenanas Homestay which is one of three places to stay on this beautiful cove. The homestay is very basic. The food is terrific, although almost always fish. Yehuda is a very decent man. A couple of things to note before arriving. The ride from Waigai is very wet. Be prepared to get wet. (We werent as we had just come off the plane). There is a dive centre, Biodiversity right next door and all of their facilities and instructors for diving are available. There is a written list of costs, all of which were much higher than what we were actually charged. In fact, the final bill was quite reasonable, about 9 million for three persons for 7 nights. We thought the cost of transport was one – way for 1 million each way. Turns out it was the round trip cost. English is very limited. (I speak Bahasa Indonesia so I know it was much easier). The water is protected, so there arent waves. Yehuda has snorkeling equipment and the reef just in front is wonderful. 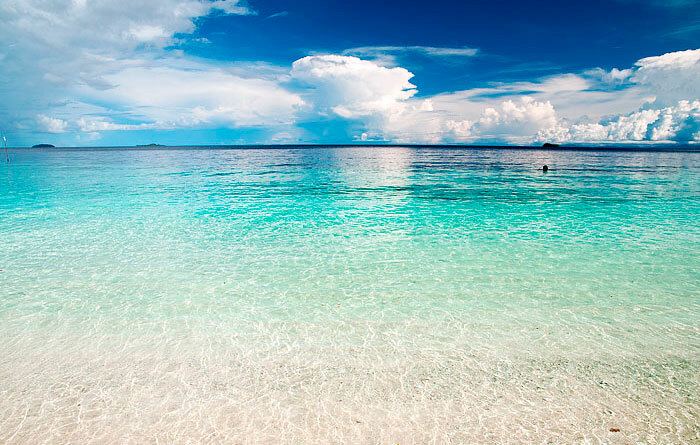 The water is extremely shallow and the reef is high, so while snorkeling is great, it really isnt the place to swim. Just to get wet. There is a nature trail into the jungle that takes about 30 minutes to reach the end. Some of the operators were charging really high per person fees to take the very well marked trail. No need to pay to be guided. Just take a walk. We brought towels and a electricity strip for added plugs. Probably snacks would have been a good idea, particularly noodles. They provide hot water so coffee is also always available. Electricity from the generator comes on around 6 pm and stays on until midnight, plenty of time to charge phones, cameras or whatever. 3G service is good there, even though we tried to avoid looking at it – the reason to go to Raja Ampat in the first place. The listing says there is a town nearby. Maybe, but not one we could walk to. Thanks for a wonderfull stay at your place Yehuda and Nonci. Your is own page on Facebook can be found at; Yenanas Paradise Bungalows. Where can I send pics? Last time we spoke to the folks at Yenanas they had no ability to connect to the internet, so unless that’s changed, they probably won’t see your message. If you’d like to add your pics (credited of course!) to their album above, please feel free to contact us and we’ll add them.